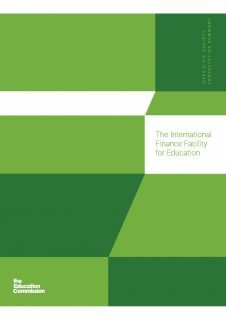 05-07-2018, Education Commission | Today the Education Commission is releasing a summary report on the recent consultation with more than 50 civil society organizations on the International Finance Facility for Education (IFFEd). The consultation provided civil society organizations the opportunity to contribute their ideas and feedback on a variety of topics related to the Facility. This consultation, which took place from April – May 2018, included an online survey, a webinar, in-person meetings, and bilateral conversations about a set of baseline principles guiding the design of the Facility. The feedback was then used to update, clarify, and amend the baseline principles for the Facility, and to inform a new, detailed technical design document on the Facility. • A summary report, outlining key issues raised during the consultation and how they have been addressed in the updated principles and technical design document. • A technical design document which outlines the structure and operations of the Facility and addresses issues raised during the consultation. • A revised set of principles, included in the summary report and technical design document, intended to form the basis of the Facility’s design and operations.